If youre looking for hotels in Augusta ME choose this renovated hotel equipped with abundant amenities and easy access to the Augusta Civic Center and Maine State Capitol. If you are searching for Augusta ME hotels truly in the center of all then the Best Western Plus Augusta Civic Center Inn is the perfect choice. The University of Maine at Augusta is just blocks away, Augusta Civic Center is within walking distance and the Maine State Capitol is just five miles from our property. Located just off of Interstate 95, you'll also be able to travel with ease to many more of the area's well-known attractions and events, including Belgrade Lakes Golf Course, Maine State Museum, Windsor Fair, Rockland Lobster Festival, Camp Laurel, Camp Modin, Kennebec Ice Arena, Muskie Institute and Colby College. If you're looking for a resting stop while traveling to or from Sugarloaf Mountain and Bar Harbor, we're right along the way. For business travelers needing hotels in Augusta ME we are near many of the area's corporate locations and organizations, including Maine General Medical Center, Togus Veterans Hospital, University of Maine, Maine State Capitol Buildings, Unisys and JS McCarthy. 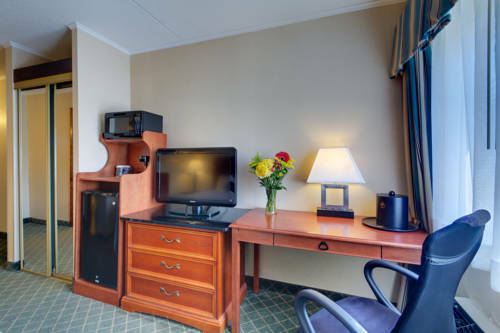 The spacious, clean rooms at this pets accepted, Augusta ME hotel offers complimentary full breakfast featuring waffles & much more, cable or satellite television with in-room movies, free wireless Internet access, a microwave, a refrigerator, room service, a desk and much more. Enjoy the serenity and fun of our outdoor swimming pool and sundeck. Additionally, our property offers an exercise facility, a 24-hour business center, dry cleaning, a 24-hour front desk, free parking and much more. For an affordable trip to Augusta, reserve a stay at the Best Western Plus Augusta Civic Center Inn today! From: The north. Take Exit 112 from I-95. Turn left and at your second set of lights, take a right. The Best Western Plus Augusta Civic Center Inn will be on your right. From: The south. Take Exit 112A from I-95. Take a right and at your first set of lights onto Community Drive, the Best Western Plus Augusta Civic Center Inn will be on the right. Walmart ,0.25 mile(s) from Walmart , national retailer of the largest selection of electronics, home furnishings, video games, baby gear and more. EJ Prescott,14.00 mile(s) from EJ Prescott, provides water pipe, sewer pipe, drain pipe and gas pipe products, backed by exceptional waterworks service. Concord Coach Lines,3.00 mile(s) from Concord Coach Lines, bus carrier providing daily service from coastal Maine to Boston. Associated Grocers of Maine,14.00 mile(s) from Associated Grocers of Maine, provides products and services to independent grocers in Northern New England. Maine State Employees Association,2.00 mile(s) from Maine State Employees Association, Maine labor union. Maine Dartmouth Family Medicine,3.00 mile(s) from Maine Dartmouth Family Medicine, physician training in primary care for rural areas. JS McCarthy,1.50 mile(s) from JS McCarthy, specializing in offset printing, screen printing, commercial printing and digital imaging for corporate brochures, business cards and letterhead. NRF Distributors,2.50 mile(s) from NRF Distributors, state of the art flooring distribution. Pine State Trading,3.00 mile(s) from Pine State Trading, New England's leader in the marketing and distribution of convenience and beverage products. Augusta Marketplace,0.50 mile(s) from Augusta Marketplace, Maine's largest open air shopping plaza!